Buffalo, New York, circa 1900. "Buffalo River and elevators, foot of Main Street." 8x10 inch dry plate glass negative, Detroit Publishing Company. View full size. Submitted by Lockportny on Tue, 06/26/2018 - 7:44pm. Today, a few of the old grain silos have been painted as Labatt's beer cans. Labatt's, a popular Canadian pilsener, is imported via the Peace Bridge between Buffalo and Fort Erie, Ontario, I believe. The import arm of the brewery is located in Buffalo. The repainted silos are a tribute to what is arguably western NY's most popular beer. You just have to see it to believe it! Also, you can tour the silos now, and even go up inside one. This is not for those afraid of heights (like me), something the tour operator stresses. One silo is used on occasion for recording music. There are also companies in the area that rent out kayaks, canoes, water boards, and water bikes so one can paddle in the Erie Canal and Buffalo River to investigate the silos, and returning wildlife. A great job has been done on the Buffalo waterfront, there is ice skating in the winter, there are new restaurants, breweries, and many wildlife habitats recreated from what was once a polluted wasteland. The City of Buffalo has a lot to be proud of for once. Submitted by Snicklefritz on Sat, 09/23/2017 - 8:26pm. I have spent more time studying this anonymous photo than any I have seen on Shorpy--and I've seen them all. It is an amazing composition. 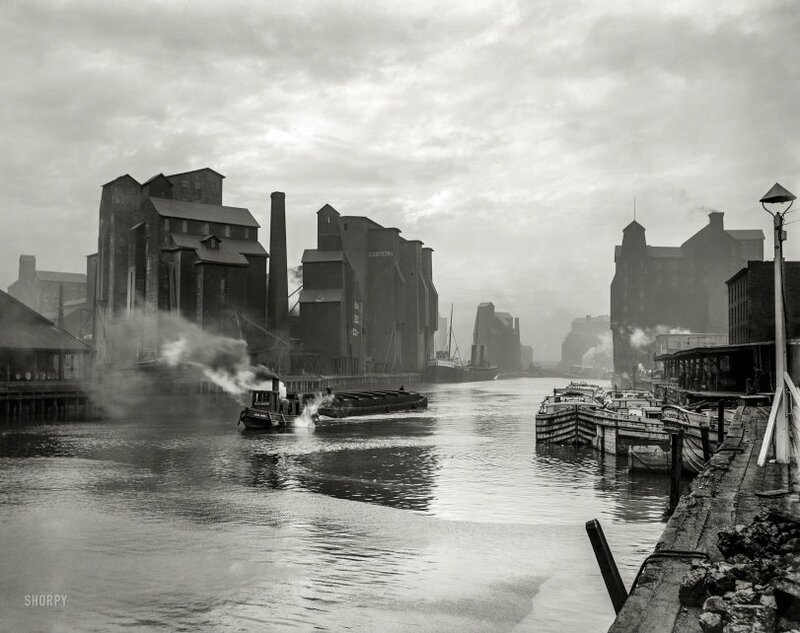 The range of tones and textures, the surface of the river, smoke, steam and clouds, the weathered dock and coal in the foreground. Those elevators look like sets for a Fritz Lang film. And the overall oppressiveness. A great photograph. Submitted by wally on Fri, 09/22/2017 - 6:10pm. Minneapolis was the flour milling capitol back at that date, but Buffalo was its big rival. Eventually, by about 1930, Buffalo became the biggest flour producer, largely due to shipping costs and a special political deal to allow Canadian wheat to be milled "in bond" in the US and passed on to European markets, which gave Buffalo a clear cost advantage.